Background: Dual-acting human monoamine oxidase B (hMAO-B) and cholinesterase (ChE) inhibitors are more effective than the classic one-drug one-target therapy for Alzheimer’s disease (AD). 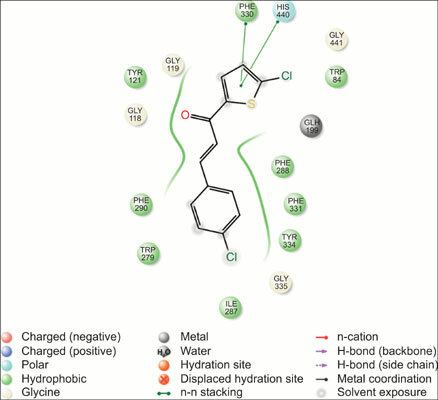 Methods: The ChE inhibitory ability of some halogenated thiophene chalcone-based molecules known to be selective hMAO-B inhibitors was evaluated. Results: Based on the IC50 values, the selected compounds were found to moderately inhibit ChE, with IC50 values in the range of 14-70 µM. Among the synthesised molecules, T8 and T6 showed the most potent inhibitory activity against AChE and BChE, respectively. Conclusion: Taken together, the data revealed that T8 could be further optimized to enhance its AChE inhibitory activity. Acetylcholinesterase, butyrylcholinesterase, chalcone, docking, monoamine oxidase-B, thiophene.